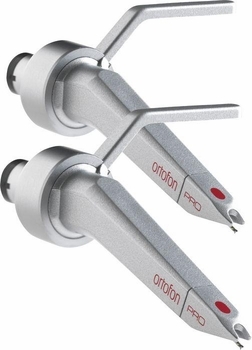 Ortofon CC Pro Twin Cartridges DJParts - All Variety of Parts that DJ Needs. This is a general purpose model for scratch and back cueing, mounted with a spherical diamond. It achieves an output of 5.0 mV. Scratching and back-cueing impose heavy mechanical stress on the cantilever and its rubber bearing. Therefore, the Ortofon Pro Concorde cartridges are equipped with cantilevers made from aluminum tube with increased wall thickness. Special attention has also been paid to the attachment of the bearing and the design of the bearing itself. This means that rough treatment will neither damage the cartridge nor degrade its stability. For easier cueing, the nose of all the Ortofon replacement disco cartridges have an extra large cut-out which makes the stylus freely visible from above, and further, the tip of the cantilever is fluorescent.